Buffet Table | Made to match the Concreta Counter from Hot Date. Chair | Counter Top | Alarm Shelf | A dining chair, counter top (base by Madoria), and fire alarm shelf to match the Concreta counter. 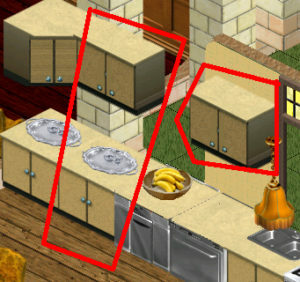 Other shelf, table and shelf on bottom right by SuperSims. 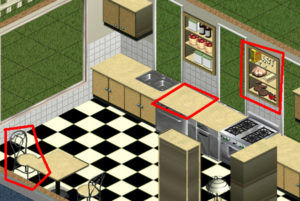 Shelf on bottom left by Simsational. 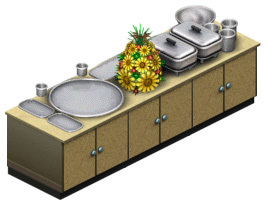 Overhead Cabinet and Counter with Cabinet | Counter with overhead cabinet originally by SimsDeco; stray odd pixels fixed by myself. I also separated the cabinet from the counter onto a painting base. Corner cabinet unavailable due to being unfinished. 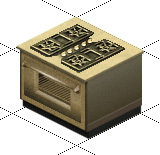 Stove | Stove made to match the Concreta counter.